Beautiful Vegan Breakfast Bowls are the answer to the breakfast blahs, one of these protein rich powerhouse bowls will jump start your engine, guaranteed! For the muesli bowl, put the oats in a bowl and add 1/2 cup of the protein milk, and honey. Stir to blend. Let sit in the refrigerator for at least 15 minutes to soften. Top with the fruits, nuts, coconut, and chocolate, and serve cold, with extra protein milk. For the vanilla chia bowl, pour the bottle of Vanilla Protein beverage into a jar or bowl and stir in the chia seeds. Let sit in the refrigerator for at least an hour, and up to overnight. Give it a stir or shake every once in a while during the first hour to insure that the seeds don't sink to the bottom. Stir well and transfer the pudding to a clean bowl. Top with the raspberries, granola, and a drizzle of honey. 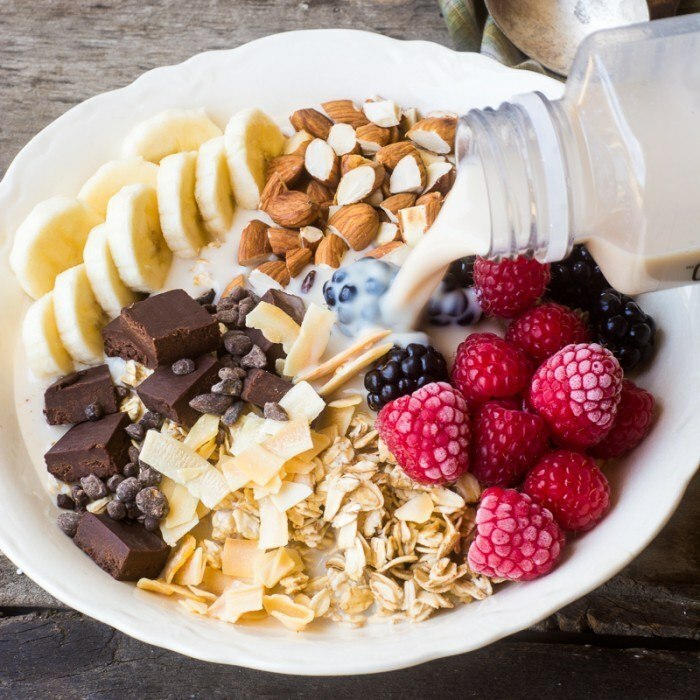 For the chocolate smoothie bowl, peel and break the bananas into pieces. Put them in a single layer in the freezer and freeze until solid. Put the chocolate protein beverage, the frozen bananas, and the almond butter in a blender and blend until smooth. Transfer to a bowl and put in the freezer while you gather your toppings. When ready to eat, remove the smoothie from the freezer and top with the blueberries, dark chocolate, chia seeds, and tangerine sections. To make the coffee chia bowl pour the beverage into a jar or bowl and add the chia seeds. Let sit for at least an hour (or overnight) in the refrigerator, stirring the seeds often during the first hour to prevent lumping. Stir the pudding well and put into a clean bowl. Top with the cherries and sliced almonds.